Here is a video of my recent set at Blue Rinse – playing material from Erasal as well as new tracks. ‘Three tracks of caustic city-driven technoustica, built from the minutia of old session recordings, hauntological cassette tapes of unknown origin, recombinant soundscapes, extracted percussion, and the processed ghosts of sound objects inhabiting the spaces I come into contact with. I have just released some new Red Pools material on the We Are All Ghosts label, three tracks made from sound sources I have recorded over the past year from multiple sources, merging close miced object recordings, harsh digital erosion, resynthesised samples, eroded drum sounds, dictaphone field recordings and found music. Currently working on a commission for GIFT festival based around Windmill Hills park in gateshead, which is merging in with the Superdream project in Johannesburg in South Africa. I’ll be presenting a work in progress on the 2nd of May from 8.30PM in the park, which will take the form of a sensor-based audiovisual installation working with field recordings and close object recordings all taken from inside the boundaries of the park. Coming up this week, AKAB / Trakt, a performance/short term installation featuring Improv/Noise duo Trans/Human, performance from Nick Kilby and myself doing a multichannel audiovisual performance derived from projected visuals and body sonification, held at The Old Police House on Swinburne place, behind Gateshead Old Town Hall, this friday at 8pm. 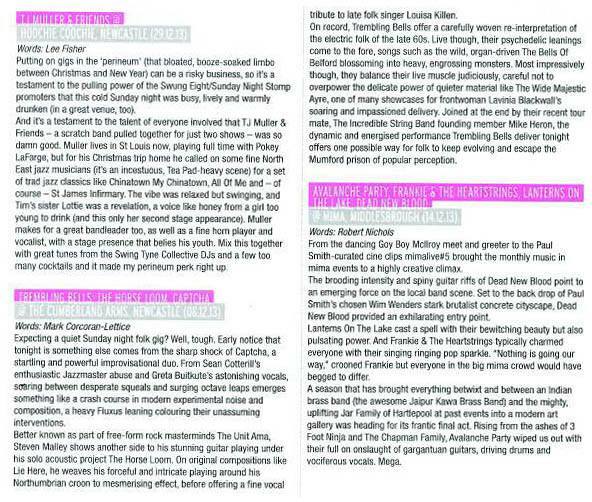 Captcha were also reviewed a while ago in NARC magazine after our performance supporting Trembling Bells and The Horse Loom! Supported by Sound and Music, Arborescent comissioned 3 graphic scores from Richard Dawson, Yvette Hawkins and Mawson Kerr, inspired by legendary composer Iannis Xenakis.